I have been a college student for almost 8 years. I have been considered a “SHY” college student for almost 8 years. Shy, in the sense that I’m not the kind of person who speaks publicly in class in equal ratio to other students. Not because I don’t want to, per se, but because I have always felt like by the time I had a thought formulated in my head that I could consider sharing, the rest of the class would already be onto the next idea. I would then feel embarrassed and uncomfortable and choose to keep my words to myself; my idea was no longer relevant. Welcome to the world of an introvert. Being an introvert does not mean I don’t like people or talking. It does not mean I am not intelligent or don’t have an opinion. It does, however, mean that I prefer (and NEED) to sit back and process information, which usually takes time. I like to reflect, synthesize ideas, and connect what I learn to my own experiences to understand the content better. While I do enjoy socializing and going out with friends, my demanding life as a grad student and employee in two places completely depletes my energy supply each day. The way I re-energize at the end of the day or week is by reading, listening to music, exercising, and taking the time to sit… and breathe. I once had a professor who told me, “You never talked, so I thought you were an idiot!” This was meant to be a compliment; when I had finally spoken in class, my perspective was considered valuable. It still hurt. We live in a culture that generally more openly recognizes its more outspoken members. Class participation points put an even greater stress on this aspect of myself, and rather than motivating me to speak up only puts more pressure on my effort to process information. It is the classroom environment that is most challenging for me to be vocal in. That’s why I enjoy writing and have chosen to go public with it. Writing is the way I prefer to communicate, and I feel I do it well. It is a communication style that allows for contemplation and revision. I have confidence in my voice as a writer, which also has taken time to develop. I have often wished that our writing could be as public as our speaking, so we would have the ability to greater recognize each of our individual strengths. But something magical happened last Wednesday in my Case Studies class. Something about the layout of the room and the company surrounding me led to me opening up more than I ever have in the past. I only wish this could have happened sooner. Maybe it wasn’t the room or the company at all, and it’s just myself growing into my professional role. I can’t be sure, but it felt so out of character. I must admit it felt good. Next week, I may or may not be as vocal, at this point I cannot know. I will not grow out of being an introvert, but I may grow into being a more comfortable one. If you find what I am writing resonates with you, I urge you not to worry. The world needs a variety of personalities, perspectives, and communication styles. Can you imagine if everyone in a room was equally outspoken? Even fields where extroversion seems commonplace need the skills and communication styles introverts have to offer. Jot your thoughts down as they come to you in class. Sometimes it is easier to speak when you’ve had a chance to write out what you would like to say out loud. Find a spot in class that makes you most comfortable. Sometimes, just your location in the classroom can add to or detract from your comfort with speaking. Don’t worry if others don’t understand or are quicker than you to offer their opinions. 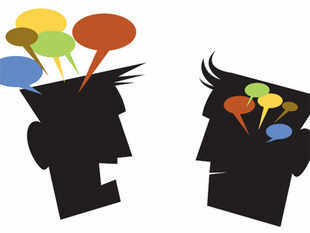 We all process in a different way; for some, they need to hear their words out loud to formulate ideas. For others, it must be done silently. Neither way is a “bad” way to be. When you’re ready, your time will come. Don’t pressure yourself to speak for the sake of speaking. It is okay to take your time to think. And remember, there is more than one way to use your voice. It’s just up to you to find the best way to share it. Just a note, the professor who made that comment to me in class was NOT a Saint Rose professor, but a professor at my undergraduate institution!